Summer is getting closer and closer. I can just feel it in the air. It's time to start thinking about how you're going to enhance your summer style with some essential pieces. These are a few of my favorite things from the Joules Vacation Shop that I think will get you in a summertime--the living's easy kind of mood. My absolute favorite piece from this collection is the Creme Bud Inaya tunic (#2). I love the watercolor pattern that reminds me of ocean waves. And the cuff detail on the sleeves makes for a guaranteed comfortable fit. The bonus? If you're on the shorter side like I am, then you can wear this tunic as a dress without the fear of mooning anyone. 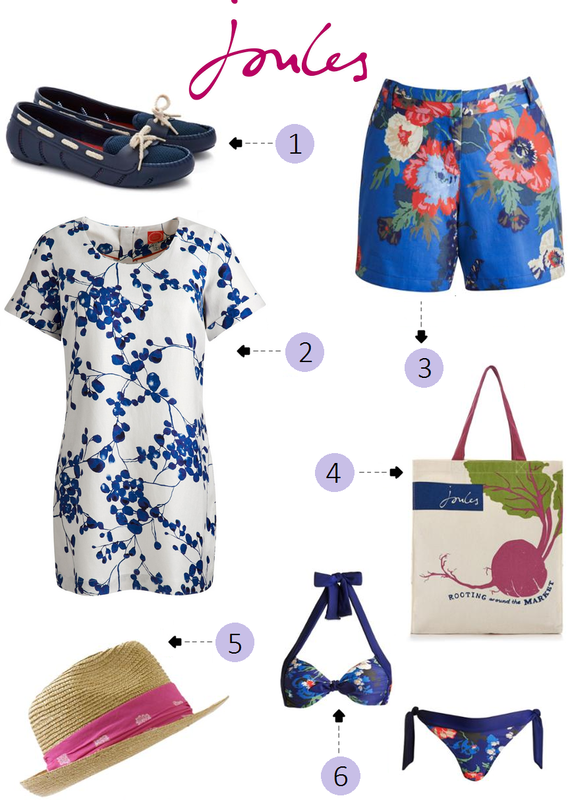 Can't you imagine wearing the blue bouquet print shorts (#3) on a summer bike ride? Or stuffing the canvas bag (#4) with fresh summer fruit at a farmer's market? I'd love to wear the chic Parisian Trilby hat (#5) for a weekend picnic. And, of course, the navy bouquet swimsuit (#6) is great for beach bumming, with the aptly named navy poolers (#1) providing perforation to keep your feet cool in the hot summer sun. Which piece is your favorite for summer style?